If you have an in-ground or above ground backyard pool, it is probably an important part of your home, where you and your kids, and perhaps their friends can spend quality time. PoolDocks offers modular and portable pool platforms which can be used to help teach tots and toddlers how to swim or just used by kids as a fun pool play platform. It is best to place the platforms away from the sides of the pool as a kind of “island” so the young children are surrounded by water. This helps tots and toddlers to gain self-confidence and not to fear water. The PoolDocks structures are designed primarily for young children weighing under 110 lbs and are not designed for heavier children or adults or aggressive play. Many of the designs incorporated by Pooldocks came as a result of suggestions from swim school instructors. Homeowners can choose from a wide range of colorful platforms, starting with the smallest portable bench for just a couple of kids in shallow water all the way to larger, more permanent platforms for multiple children in deeper water. The standard “open” platforms are the easiest to assemble and move, but for maximum safety, Pooldocks offers platforms with side panels to ensure no one can swim under the platforms. The PoolDocks are modular structures made from colorful, strong and durable components that can be quickly and easily assembled by older children or adults. Detailed assembly instructions are included with each platform. Since the plastic is lightweight, all platforms require additional weights to keep them on the bottom of the pool. In addition, all the components have rounded corners and are completely safe for young children. If a component should break over time, it can easily be replaced. While Pooldocks offers quite a variety of designs, customers may wish to make their own on-site modifications, but Pooldocks takes no responsibility for any modifications which lead to accidents or injuries. Individual components may be purchased from Pooldocks. Caution: Pooldocks strongly recommends that responsible adult supervision be present any time children play in the pool with the platforms and that all pool safety rules are followed. For those homeowners who have a shorter summer season, the portable swim training pool platform can be pulled out of the water and used as land based play structures, until the following summer. 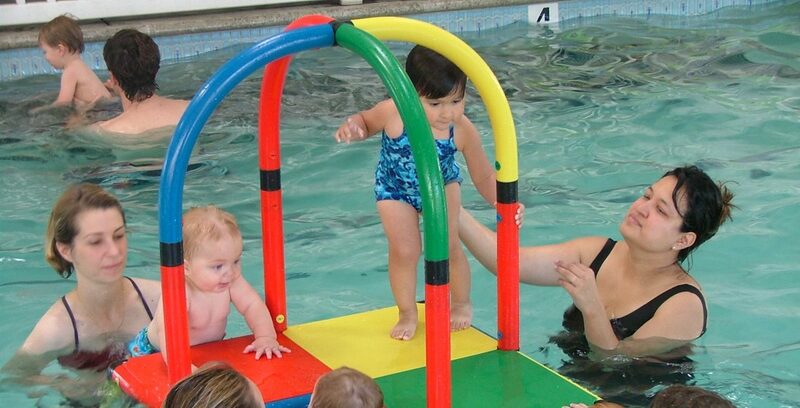 In addition to help teach kids how to swim in backyard pools, the Pooldocks portable swim training pool platform are also used by many swim schools, YMA’s, JCC’s, health clubs, aquatics centers, summer camps and other facilities to teach babies, tots and toddlers a safe and friendly way to swim.